Topical Antiandrogens are a mandatory part of any hair loss treatment regimen. They primarily play the role of “prevention” and “maintenance”. If you could keep all the hair you have today, would you take steps to accomplish that? Androgen Blocking treatments like S5 Cream are hit hair loss from yet another angle, inhibiting causes of hair loss locally, on the scalp. 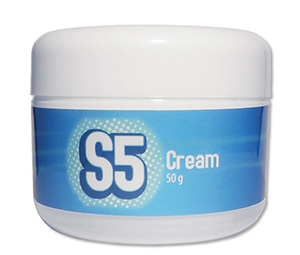 Who is S5 Cream for? Simply put, Propecia (Finasteride) is the most potent hair loss treatment on the market today for men. Women with androgenetic alopecia (thinning) stand to benefit from antiandrogens as well, but can’t take Finasteride due to side effects. Most people either don’t feel comfortable taking them orally, or they want even more power behind their current regimen by adding a proven topical. S5 Cream is a topical alternative to internal chemical antiandrogens, providing the benefits without the side effects. Its a poweful, scientifically-backed formula that works as an incredibly potent “androgen blocker”. Whereas Propecia inhibits the creation of DHT in the bloodstream, S5 Cream blocks DHT from binding to receptors on the scalp. If you’re up for it, using both S5 Cream and an internal antiandrogen like Finasteride would be a powerful and effective way to stop and reverse your hair loss. Women can take internal Spironolactone with the consent of their physician. How does S5 Cream work? Remember that Propecia, as a “DHT Inhibitor” takes upwards of 1 to 2 years to show results. S5 Cream is the same. The reason for this is simple: they’re stopping further hair loss, and enabling your hair to restore itself. This takes many hair cycles, and will require your patience. Hairs in certain areas of your scalp have been genetically programmed to become sensitive to DHT. Propecia blocks DHT from forming at all. Antiandrogens block the remaining DHT from attaching to your follicles. Follicles develop receptor sites. DHT binds to those receptors and tells your body to begin rejecting the follicles. The reason for this isn’t totally understood, but the solution is simple. Propecia stops DHT from forming, and S5 Cream stops DHT from attacking. It’s a perfect solution. Even without Propecia, a topical antiandrogen can do its job just fine. Where does S5 Cream Fit Among Other Treatments? HairLossTalk has always promoted products that have data backing them. We have two major categories for this: Clinically Proven treatments that have undergone human trials and FDA approval. And Clinically Backed treatments who’s ingredients have science backing them to perform some function which addresses a known cause of hair loss. Topical Spironolactone fits at the top of the list, right alongside Finasteride and Rogaine. Though the FDA has not conducted an official clinical trial, the science backing 5% Spironolactone when applied topically is abundant. It is both safe and effective at blocking DHT from attaching to the receptor sites in the scalp, which cause hair loss in the first place. We encourage you to read this insightful interview with Dr. Richard Lee on the science behind S5 Cream’s ingredients. The rule goes like this: if you’re happy to keep the hair you have today, and to possibly thicken up just a bit after a couple years, then a topical antiandrogen like S5 Cream is a good solution. Just like Propecia, these treatments are extremely good at what they do, but they require patience. They don’t result in a big bushy head of hair in 3 months. They are the patient person’s intelligent method of attack on DHT. And they will do more for you over the long term than any short term, fly-by-night hair growth stimulant can. They work to stop further loss, and help you stay at your current baseline without losing new ground. You can always combine S5 Cream with Propecia, Rogaine, Tricomin, or any other topical to increase your chances of success. Its totally up to you. This treatment should be applied to the areas of your scalp which still have hair, but may be thinning. Applying it to bald, slick scalp will not likely help, as those areas have progressed too far to be salvageable. Update March 2017: We have put together a tutorial on the best way to apply s5 cream to a hair bearing scalp. We encourage you to check it out before you purchase. Simply dab a small amount onto your fingertip and smear it up a “part” in your hair. You can also simply swirl it around at the base of the hair. Use a sparing amount and it should not affect your hair styling at all. The goal is to get a very thin layer onto the affected areas of your skin. Over the next couple hours, it will absorb and spread at least an inch in every direction. You do not need to use a lot. Topical antiandrogens block androgen receptors. It is not a “DHT Inhibitor”. These are two different (and very helpful!) approaches to treating hair loss. Since S5 doesn’t also block DHT topically, some feel that alone, its not sufficient to do the job. This is where Revivogen comes in. Revivogen works magnificently to inhibit DHT on a local level, thereby hitting it from both angles. Many of our members who saw success on Propecia have maintained their results on a combination of topical antiandrogens and Revivogen. The S5 is used twice a day and Revivogen once a day. We encourage you to read this helpful article on a combo treatment of Revivogen and S5 Cream. The last paragraph hits it on the head. New Treatments are constantly released. Register to stay informed the minute we announce a new one.